I am currently working on the schedule of events for the Siege. If you anyone would like to present a program, display, talk or demonstration please let me know so I can mention it on the schedule. ED NOTE: The tea will be on Saturday afternoon for all reenactors. We’ve always had successful teas thanks to your fantastic generosity. Please be thinking of bringing something to the tea. It would be sad if all they had was a cuppa. I have attached the updated volunteer sheet for Saturdays at the Fort. If you would like to take a Saturday that is open please let me know. Also please be thinking about bring in your auction items for the Siege. We have very few items as of now. Nov 5 xxxxxxxxxxxxxxxxxxxxxxxx Military Timeline/Harvest Fiber Show in Visitor C.
I hope everyone is well and filled with the joy of the Easter Holiday. I wanted to update everyone that sent in their dues. They have been received and have been sent to the treasurer of the Friends group. Your checks should hopefully clear on your next statement. I’m looking forward to seeing you all at the Carter Mansion Celebration on April 2-3. I want to encourage as many as will to come and camp. We have bathroom facilities at the mansion but no showers. I will arrange to have the shower facilities at the park open if anyone wishes to use them. So far we have a great lineup of activities…. Corn Shuck Dolls – Tammy M.
Inkle Loom – Travis S.
18th Century Beverages – John & Becky G.
If anyone else would like to present a program or display please let me know. It’s not too late. Travel back to the 1780s… The American colonies have declared Independence, but the outcome of this bitter struggle is still in question. Hardy frontiersmen have crossed the mountains in defiance of British law and have carved out homes in the wilderness. Conflict is rising between American Patriots, Loyalists who support the Crown, and native Indians who struggle to retain their way of life. But the people of this time still find cause for celebration and merriment so come out and see it all come together at the oldest frame house in Tennessee. The Historic John and Landon Carter Mansion, built ca. 1775-1780, boasts beautiful over mantle murals, hand carved moldings and raised panels making it one of the most treasured sites in Tennessee history. The house is the only surviving link to the famed Watauga Association, the democratic government set up by the early settlers in the Watauga Valley. The home’s builder, John Carter, served as a chairman of the Association. The Washington County Regiment of North Carolina Militia, Sycamore Shoals’ host living history organization, will be celebrating its seven-year anniversary during this exciting celebration! The Militia will be encamped on the grounds of the Carter Mansion and will present demonstrations of the daily lives of 18th century backwoods settlers. As part of the activities a re-enactment of a small battle between Patriots and Tories will be presented each day. Local craftsmen and artisans will be on hand throughout the weekend showcasing and demonstration traditional arts and crafts. Other activities throughout the weekend will include Tours of the Carter Mansion: Tennessee’s oldest frame house, Militia Drill, Musket and Rifle demonstrations, Traditional Music, Storytelling, Colonial Military Music by the Watauga Valley Fifes and Drums, and much more. Come join us for a weekend of History, Entertainment, and Family Fun! I received a call from Bob McCroskey the other evening. Bob’s sister, Mary Lou, whom he often mentioned at our church services, passed away last week. Bob always mentioned how much she appreciated our thoughts and prayers and said that she was confident that it was the prayers that kept her going eight years further than she was given by the doctors. Join with me in prayer as we ask for comfort for Bob and his family. Also Let’s remember Bob Ritchie. He has some major decisions to make concerning heart surgeries. I know that he and Norma will appreciate all the thoughts and prayers we can offer. 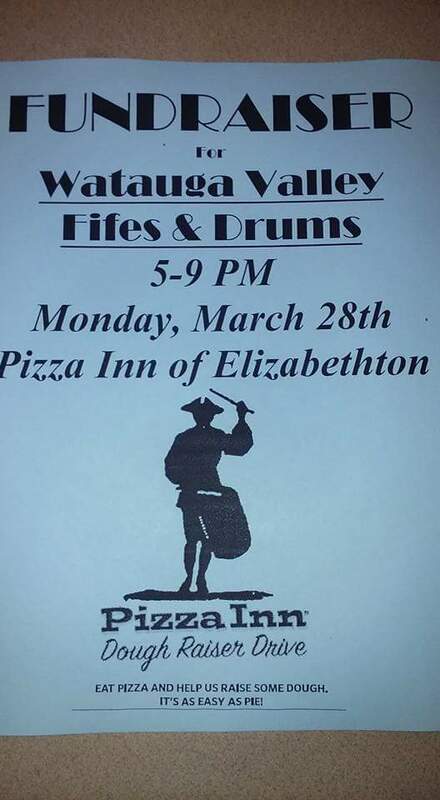 The Fife and Drum is having a fund raiser at the Pizza Inn in Elizabethton next Monday between 5 and 9 PM. The Watauga Valley Fife and Drum has been recognized by the TN legislature as being the official fife and drum group in the State, however they are totally self funded. They work very hard and diligently to be the best they can be. Please come out and support. First, I wish to thank all that were able to go to Walnut Grove this past weekend. It was a most enjoyable time and the site manager and our host (the SC Rangers & Capt. Moss) were very appreciative of our assistance and presence. The Carter Mansion celebration is coming up soon. April 2-3. You may recall that we decided to scrap doing the Colonial Skills and Trades in February on account of the unpredictable weather, and chose to present them at the Carter Mansion Celebration instead. This is a great time to showcase these types of programs. The weather is warming up and there is no lovelier place than the Carter Mansion. Please let me know if you would like to present a program, display, or talk that weekend. I am open to new ideas and comments. As usual we will be doing the salute to the Carter Family in the cemetery Saturday morning and the Skirmish both days at 1pm so come prepared to shoot.